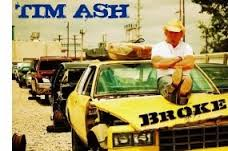 Tim Ash is no stranger to hard work, music or near death experiences. Hailing from a long line of family musicians, he set his career aside to provide for his family as a pipefitter. It took him over two years to overcome injuries he sustained after being pinned beneath a half-ton of steel in a life threatening accident. His self-produced debut “Up On Blocks” is a 12-track collection full of meaningful lyrics, traditional instrumentation and one of the most poignant ballads in recent memory (Losing Her All Over Again). It is a deeply personal effort punctuated by a few party anthems that lighten the tone. He phoned from Nashville to discuss the project and his career. TA: My faith, family and fighting spirit are all parts of it. I grew up in a family of hard workers and people who believe in a higher power than us. those things really paid off for me. TA: Honestly, none. The first record I had out (“Get Real”) was full of songs about it. I would say I’m over that experience. It was 13 years ago, It was definitely life changing and still sticks with me, but my life has changed so much for the better and my music has changed, so I just sing about the stuff that’s going on now. TA: It helps in that I was a hard-working blue-collar guy that worked with my hands and had a strong work ethic. That’s very relatable to country music fans and it’s helped me a lot. TA: A little, it helped navigating the waters. I moved around a lot and went to five different high schools. That taught me how to be the new guy all the time, so I’m quick to adapt and have never met a stranger. TA: It’s very important. At the end of the day, it’s about putting food on the table for my kids, and giving them more of a chance to have a better life. I’m not star struck. I don’t have dreams of being a star. I just want to be a better father and husband. It’s more of a responsibility than wanting to be a star. TA: I have to say that If it wasn’t for the style that country music is now, I wouldn’t be in it. I grew up in the era of Journey, Bad Company and Supertramp. But I also love Johnny Cash and Waylon Jennings. So it was an easy transition. I remember when the days of radio were John Cougar, Hank Williams Jr. and then Madonna and Bon Jovi. It wasn’t hyper-categorized. That’s the way it should be. Music is music as long as it’s good and relatable, it’s fine no matter how it’s classified. TA:I found out yesterday that we’re going to cut a track I wrote called Jesus and Johnny Cash as a single and release it in February. We’re going to swamp it up and make it more muscle shoals. There’s a very well-known producer behind it and it will be a career changer for me. It really defines who I am. TA: I’m not really Bruce Lee, but I have some moves. My show is high-octane. I try to incorporate a lot of David Lee Roth, Garth Brooks and Chris Ledoux. People are paying good money, you’ve got to give them a show, not just stand there and sing your songs. I wouldn’t want to go see a show like that. TA: Kenny Rogers vocally, Bob Seger, Jon Bon Jovi, because I’m a child of the Eighties. TA: It’s absolutely key for a guy like me to be able to make it in the industry without a major record deal. We can do things now that record labels could only dream of back in the day when they had to spend millions of dollars. Now we do things with the click of a button. TA: I know there are guys in droves in Nashville that go into cubicles and write songs. I’m not that guy. I sit on my back porch watch my kids play and take in life and songs come out. Like the song, Losing Her All Over Again, My dad was over at the house and told me, “I keep getting mail with your mom’s name on it and I lose her all over again.” That song just came out naturally and organically.